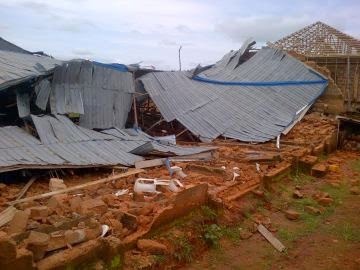 Barely two weeks after a church building collapsed in Uzama Street, Off Oliha Quartres, in Egor Local Government of Edo State, leaving one person dead and injuring no fewer than three others, another church building has collapsed at Asoro Slope, off Ekenwan Road in Benin. The church auditorium, which belongs to the Liberty Power Bible Church Incorporated, was said to have collapsed around 1.30pm after a heavy rainstorm on Sunday. Although no life was reported lost, a residential building was, however, said to have been affected by the disaster. The owner of the church, identified as Apostle Moses Erue, was said to have returned few hours after the collapse to salvage some of the church property. Punch Metro, however, gathered that the church auditorium may have collapsed due to the use of sub-standard building materials. The owner of the residential building, Mr. Ajoh Silvanus, told our correspondent that he earlier warned the owner of the building severally about the inferior materials being used for the construction of the church auditorium. He lamented that the church owner was only concerned about the safety of the church speakers, rather than the damage done to his own building. He also revealed that the owner of the church had been apprehended by the police. Ajor said, “I have been complaining to the pastor of this church that he was erecting the church like a fence without pillars, even the blocks were made with ordinary sand. “There were no pillars in the the main building and outer part was build with three rods. I complained to him several times but he refused to listen until yesterday when the building collapsed and damaged many things. “I thank God that it did not kill anyone because one of my younger ones narrowly escaped. The Edo State Police Public Relations Officer, DSP Noble Uwoh, could, however, not be reached to confirm the incident at the time of filing the report.